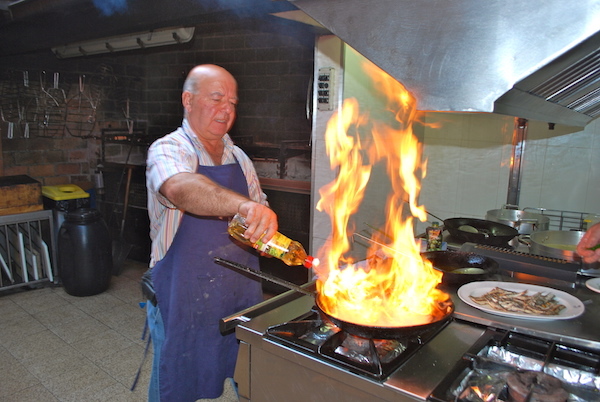 Cooking Passions Cuisine & Culture Journeys have been designed so that you can make the most of your precious time, as we have done all of the “behind the scenes” research to scope out the finest luxury hotels, local transfers, sights, restaurants, spas & excursions, so you don’t have too. Each of our tours are designed so you can do as much or as little as you like, while allowing you plenty of free time to explore and immerse yourselves in the sights, shopping, relaxation and eating that YOU want to experience (we’ll be happy to provide suggestions and tips on some of our favourites from our previous trips). So all you have to do is book your preferred flight, pack a bag & a sense of adventure, and join us for an unforgettable and luxurious Basque Cuisine & Culture experience!! Visit to one of the oldest salt production facilities in the world where “White gold” has been produced uninterruptedly for 7,000 years. Set on the golden crescent-shaped La Concha beach in the Basque Country of Northern Spain is the enchanting seaside beach resort of San Sebastian (Donostia in the Basque language) – one of Spain’s “most beautiful” towns. Long before there ever existed a “Costa Brava” or “Costa del Sol”, wealthy Spaniards followed in the footsteps of Queen Maria Cristina who, in 1886, chose this charming seaside town for the Royal Court of Spain to spend its summers, making it all the rage of it’s time. 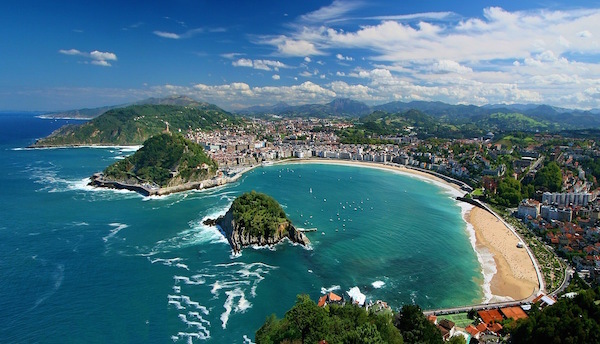 With its elegant & refined “Belle Epoque” resort feel, San Sebastian is synonymous with quality of life – some of the world’s greatest eating experiences combined with a relaxed beach & surf culture on the glistening shores of the Bay of Biscay. 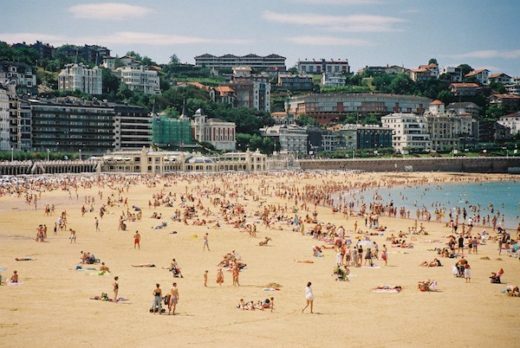 Recognised as the culinary capital of Spain, San Sebastian is the only city in the world that sparkles under more Michelin stars per capita, and the only city in Spain with more restaurants, bars and taverns per square kilometre than any other. 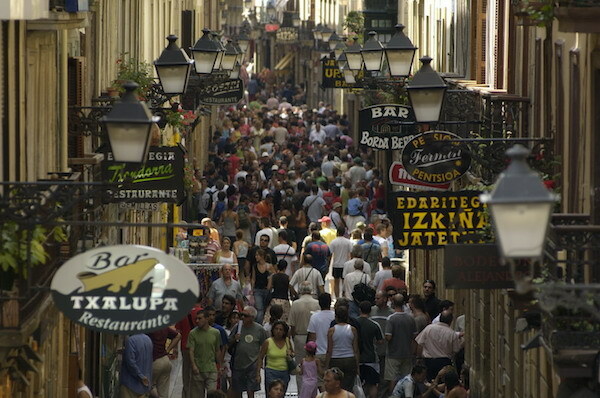 San Sebastian is the cooking epicentre of Basque gastronomy with good eating an important part of Basque culture. It has an almost reverential respect to organic seasonal products and only the best raw materials are used by restaurants and famed Michelin-awarded chefs of San Sebastian’s “New Basque Cuisine” revolution. Pintxos (Basque tapas) – One of the distinquishing marks of Basque gastronomy, pintxos (“pinchos”) is the classic “miniature cuisine” which has experienced unparalleled sophistication in the last few years, with more and more complex creations presented in bars across San Sebastian’s Parte Vieja (Old Town). 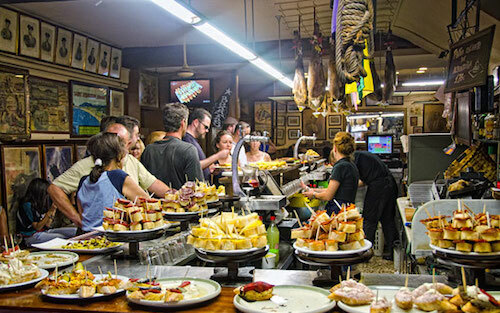 San Sebastian is the world capital of pintxos, and it even has it’s own tradition which the locals carry on called txikiteo – bar crawls through the public houses of the Parte Vieja, each offering their own pintxos speciality. Washed down with the Basque country’s fine, young regional wine, txakoli, or a spicy red from the nearby Rioja wine region, you continue until you are suitably full, keep a tab of what you have eaten, then settle up with the bar staff before moving on to the next establishment. 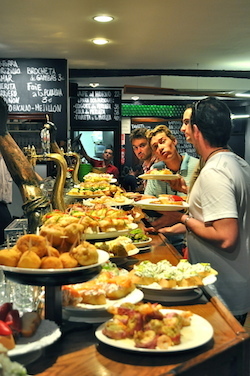 Txokos (Private Gastronomic Eating Societies) – A Basque tradition established in the 1840’s, San Sebastian’s txokos are gastronomic societies where Basque men come together to cook, eat, drink, talk and sing. Each txoko has a society constitution that sets out the maximum number of members, administration issues and a communal funding system. Originally women were not allowed entry to a txoko, however most txokos now allow women access to enter the txoko to eat, drink and socialise, but not to cook. 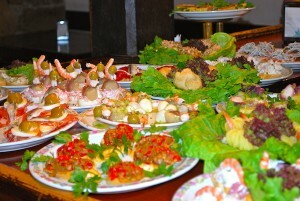 Meals can be elaborate affairs featuring dishes made from the Basque regions bountiful supply of fresh produce. Txokos operate on an honour system where each member is expected to keep track of what stocks were used from the communal foodstores and how much alcohol their group consumed. 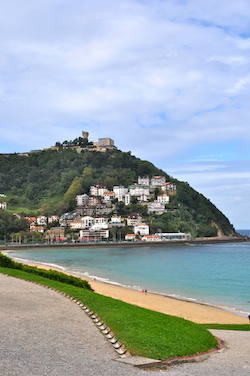 During the Franco era, txokos became a refuge for many Basques. As the constitutions of the txokos prohibited the discussion of politics on the premises, people could meet without state control, so they were free to speak Basque and sing Basque songs which was illegal during Franco’s realm. 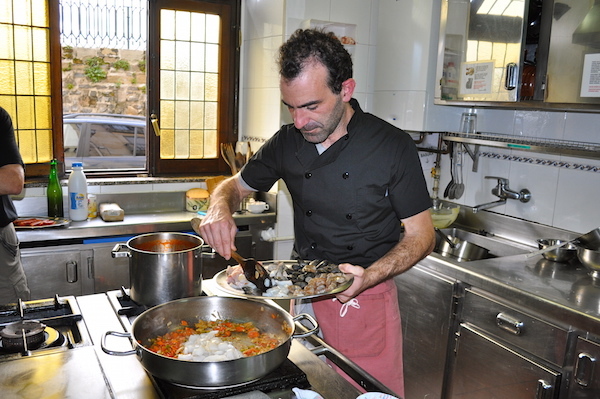 New Basque Cuisine – Influenced by the nouvelle cuisine of France in the 1970’s and 1980’s, Basque chefs created the nouvelle cuisine basque, which, while retaining a solid Basque substance, were lighter and less rustic versons of traditional Basque dishes and flavours. 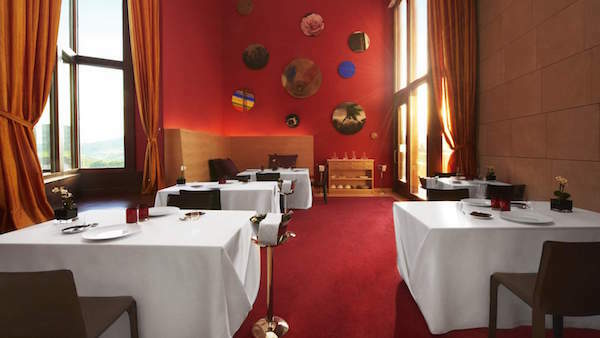 San Sebastian boasts three of Spain’s five Michelin three-star restaurants (Arzak, Akelarre & Martin Berasategui), complemented with other great two-star (Mugaritz) and one-star restaurants to total 16 Michelin stars. 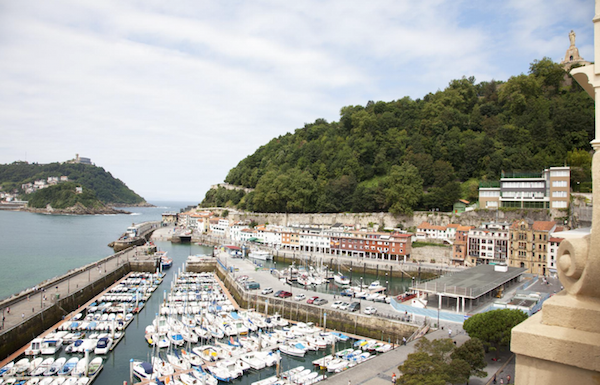 This fact makes San Sebastian the city with more Michelin stars per square meter in the world. 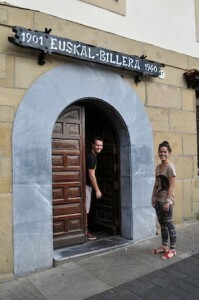 ARRIVAL – Arrive in Bilbao at your leisure so that you can have a rest before our tour begins. Flights arrive into Bilbao Airport, from many European destinations. 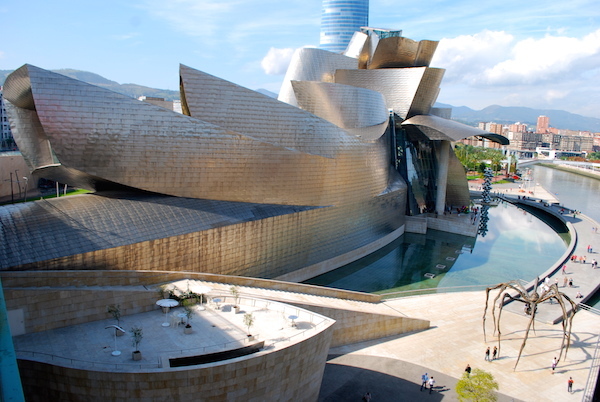 PRE TOUR ARRIVAL* – Should you wish to have an extra one or two days in Bilbao to visit Bilbao’s famous Frank Gehry designed Guggenheim Museum, or if you would like to eat at the world’s No.10 restaurant – Asador Extebarri (bookings open on 01 July 2019 for September availability) please arrange to arrive prior to our tour start date to allow you enough time to experience these. Bilbao, with a population of 350,000 , is an industrial port city in northern Spain and surrounded by green mountains. Once a prosperous steel production, shipping, ship building and banking city, by the 1970’s the city had developed into a gray smokestack and a serious economic crisis had arrived. 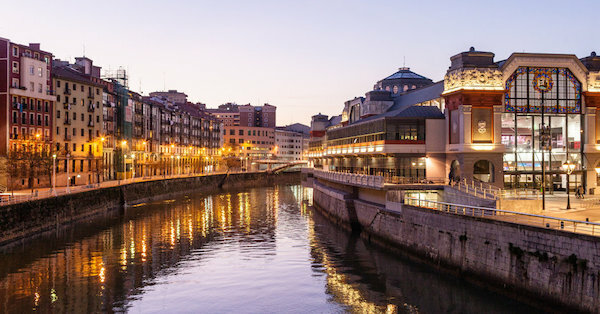 A new plan was devised and Bilbao started its journey of rebirth becoming one of the most cosmopolitan cities of the region and the de facto capital of Basque Country. This once heavily industrial and gritty city now shines with culture, thanks to the Museo Guggenheim, which sparked revitalization of the city when it opened in 1997. Designed by Canadian architect Frank Gehry, the museum houses prominent modern and contemporary works, but it’s the curvy, titanium-clad building that receives the most attention. 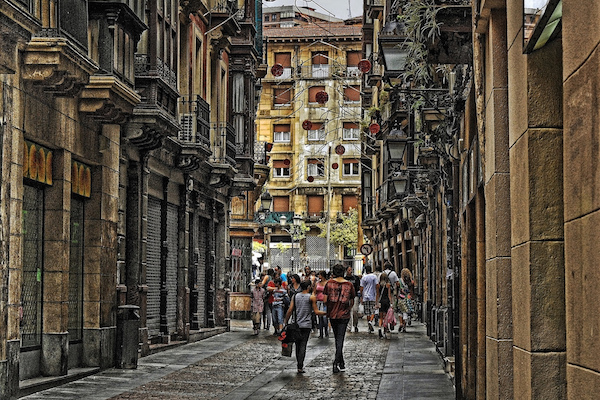 Bilbao’s historic Casco Viejo neighborhood along the city’s Nervión River teems with architectural interest and excellent restaurants and small shops, and gorgeous old churches pepper every district in the city. Bilbao’s “titanium miracle” known as the Guggenheim Museum is much more than a simple art gallery or a mere exhibition hall. It is the emblem of a modern and versatile Bilbao. The artworks surrounding the building – PUPPY, by Jeff Koons and MAMA, the Spider, by Louise Bourgegois – have become icons of the ‘new’ city. Nestled between the Guggenheim Museum and the Museum of Fine Arts, the hotel Miró offers spectacular views of Frank Gehry’s emblematic building. It is only a few short steps from the city’s shopping area, and within walking distance of the quaint Old Quarter (Casco Viejo). am – Breakfast at your leisure. 09:00am – Check out from our hotel. 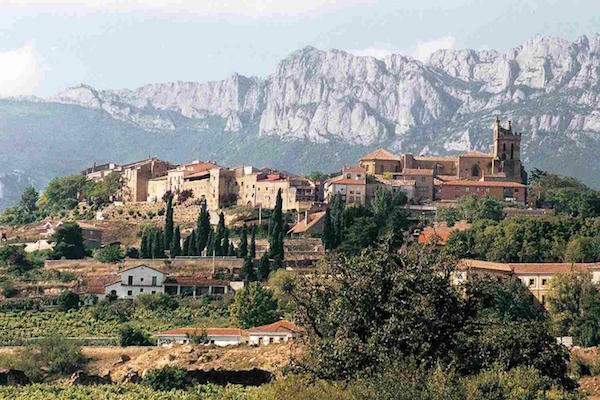 Group departure to Spain’s famous La Rioja Wine Region for our exploration of this famous Basque region and medieval villages of Laguardia & Elciego. Romans brought the vine plant with them when they landed in this Southern Basque Country over twenty centuries ago. 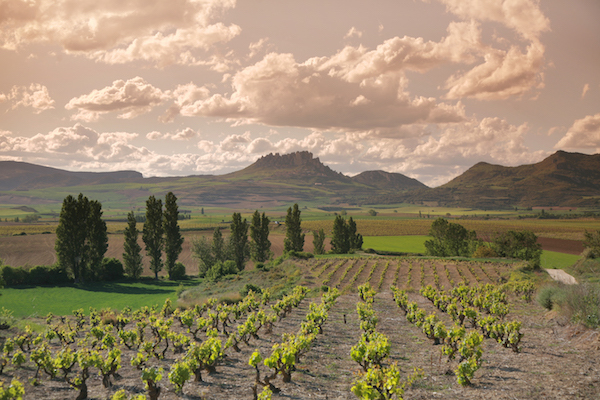 With a history such as this, the Rioja Alavesa has established one of the most rooted, reliable and forceful wine traditions in all of Europe. It is a region which not only produces wines under a “designation of origin” recognised as one of the best in the world, but combines it with a gastronomy tradition and charming fortified historic villages scattered across the vinelands. 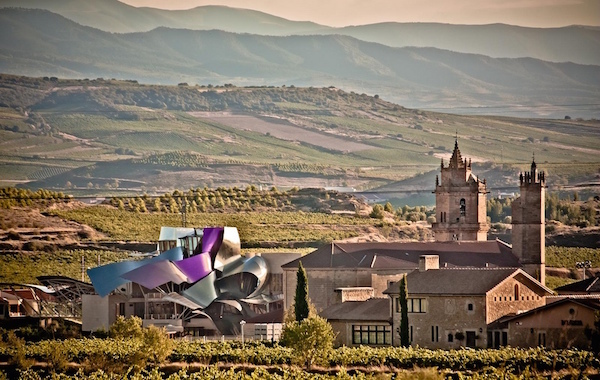 Far from resting on its history, some of La Rioja’s main wineries have embraced change and entrusted the renovation of their facilities to renowned architects. 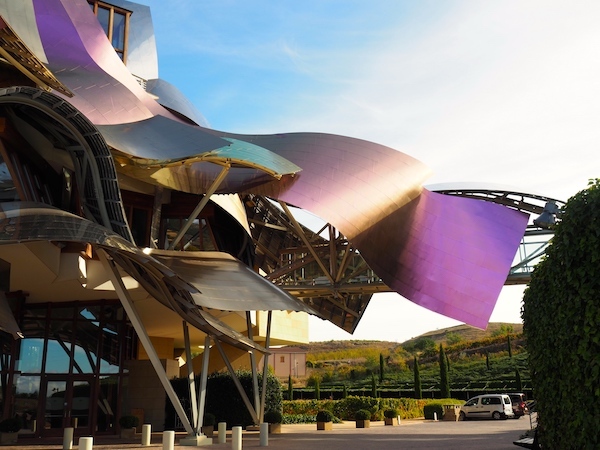 These include Bodega Ysios designed by Santiago Calatrava; Bodega Baigorri by Iñaki Aspiazu; and Canadian architect, Frank Gehry who designed the titanium “City of Wine” for winery Marques de Riscal to celebrate its 150th anniversary in 2008. Set atop a hill in the middle of a valley is the picture-perfect town of Laguardia. This walled town is surrounded by vineyards on all sides and offers a glimpse into the region’s wine making past. 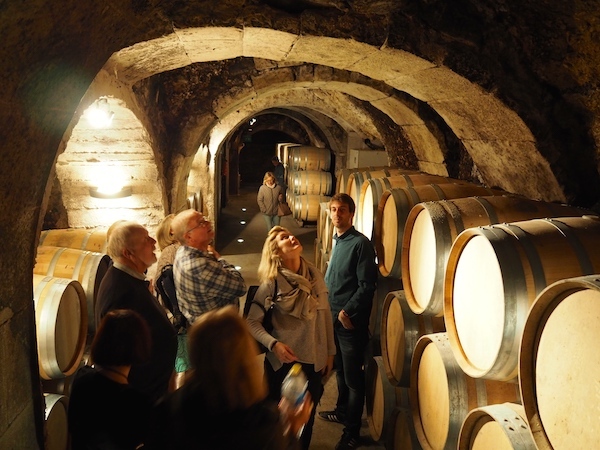 A few of the wine cellars located under the town houses are open for tours and are a definite must see. Founded in the 10th century as a defense town for the kingdom of Navarra, this beautiful walled town is located in a hill overlooking the vineyards, with the Cantabrian Mountains in the background. It is without a doubt the most known, but also the most attractive, town of the region. 10:30am – Arrival in village of Laguardia for a visit of this lovely village. 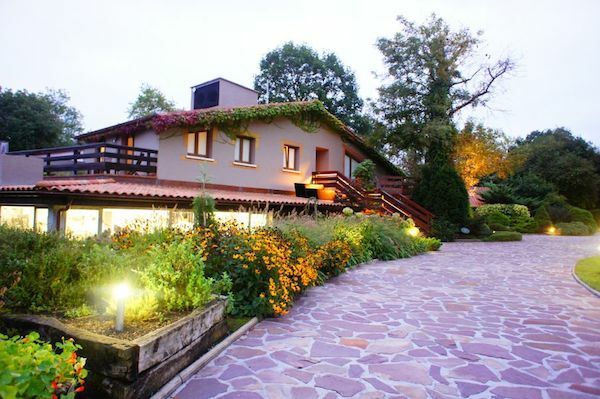 Enjoy the walk through its medieval narrow streets or the picturesque park walk with spectacular views of the regions majestic vineyard landscapes and Cantabrian Mountains. 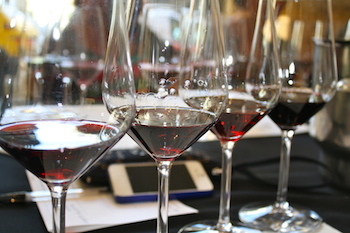 11:00am – Guided visit and tasting at one of the region’s oldest wineries, the 15th century Bodega Casa Primicia. Following our winery visit, visit one of the many bars in the village for a quick bite of pintxo or raciones before we continue our wine journey to the village of Elciego. 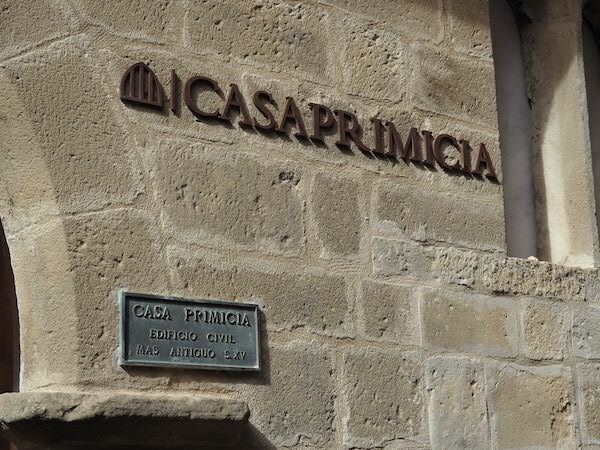 Situated in one of the oldest buildings of the 11th century village of Laguardia is Bodega Casa Primicia. With its over five hundred years history, stepping in through the doorway of Bodega Casa Primicia presents a building whose wooden roof structure has withstood the test of half a millennium. 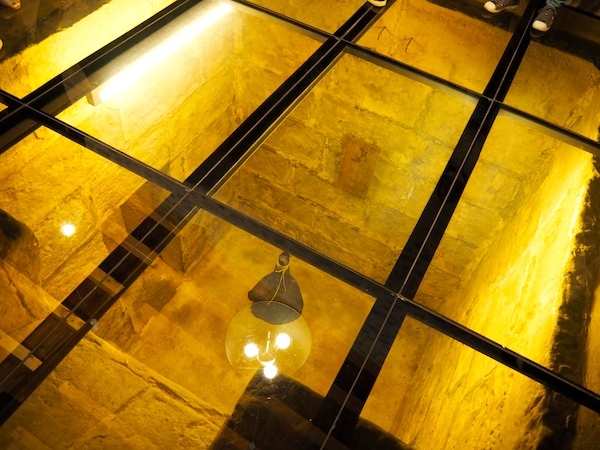 We will visit the cellars and ancient tunnels of one of the oldest wineries in the village followed by a wine tasting of Casa Primicia’s wines. 13:00pm – Depart Laguardia for the short transfer to the medieval village of Elciego and one of La Rioja’s most famous wineries – Marques de Riscal and it’s “City of Wine”. Marques de Riscal is without doubt Rioja Alavesa’s grandest name and most important house. 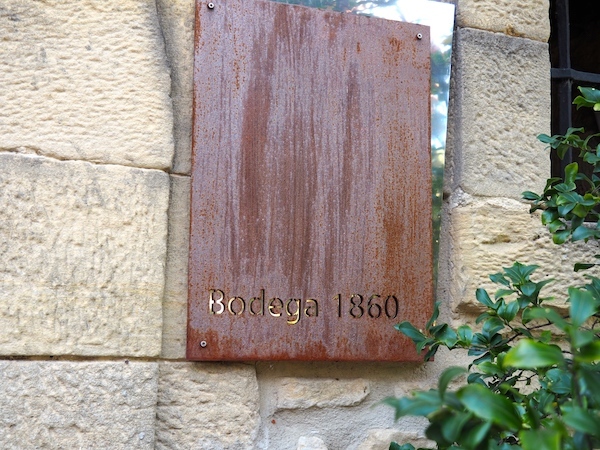 In 1858 it became the first winery in the Rioja to produce wines following the Bordeaux method. Don Guillermo Hurtado de Amézaga, the Marqués de Riscal, was asked by local producers to find a French wine expert to train them in the winemaking techniques of the Médoc. 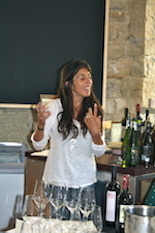 Subsequently he hired Jean Pineau, winemaker at Château Lanessan to come to Spain and the rest, as they say, is history. The Marqués de Riscal’s City of Wine merges deep rooted wine-growing tradition with twenty-first century avant-garde design. 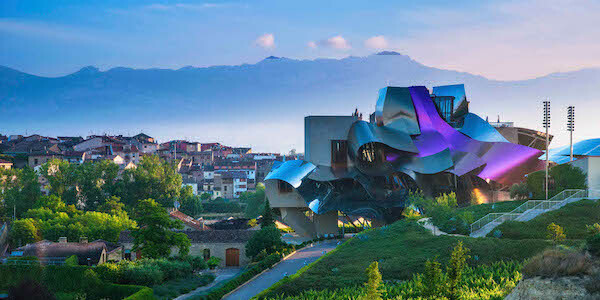 Nestled in the renowned Marques de Riscal’s vineyard in the medieval village of Elciego, the winery’s spectacular curves, titanium roof and asymmetry of walls provide an elegant contrast to the historic wine cellars designed in 1858 by the architect Ricardo Bellsola, and has become one of the “Ten Architectural Wonders of the World”. 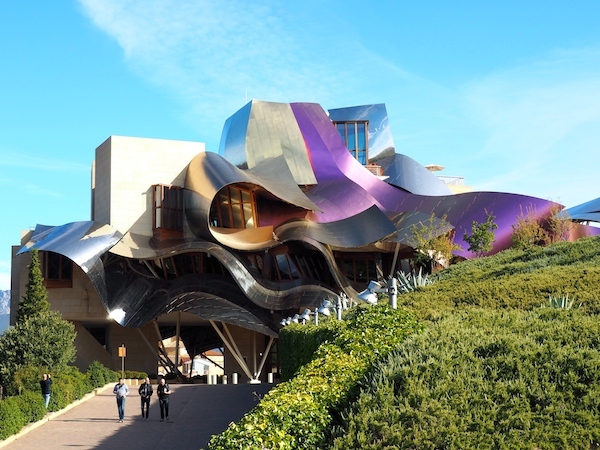 Designed by internationally renowned architect Frank Gehry, the Marques de Riscal Hotel is a true masterpiece. Located in “The City of Wine,” this 5-star hotel is an adventure of a lifetime. Welcome to the only hotel created by Frank Gehry where each of the unique 43 guestrooms and suites promises to enchant with exceptional designer touches and enviable views of the countryside, medieval town of Elciego or the striking architecture. Remainder of the afternoon to relax in your room, lounge in the stunning rooftop hotel library, or to wander through the small village of Elciego. 16:00pm – Marqués de Riscal Winery Visit & Tasting where we will visit its original 1860 cellars and modern facilities before a tasting of its own wines. 20:00pm – Dinner at the 1-Michelin Star “Marques de Riscal” restaurant which was awarded it’s first Michelin-star on 25 November 2011. Riojan chef, Francis Paniego and his young, dynamic team of 15 chefs present a fusion of tradition and modernity with a careful selection of local-produced and seasonal ingredients in a 14 course Michelin-starred menu. 10:00am – Check out from our hotel and transfer to the historic Valle Salado for a visit to one of the world’s oldest salt production facilities that has been operating intermittently for 7,000 years. 11:00am – Guided visit of the UNESCO World Heritage Valle Salado de Añana (Añana Salt Valley). Valle Salado is one of the best examples worldwide of the history of salt, known since antiquity as “white gold”. 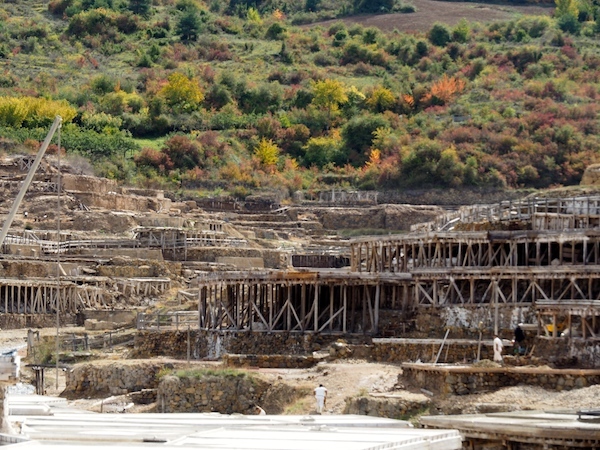 The natural emergence of the salt springs caused the establishment of a settlement in the surrounding area that has developed uninterruptedly for thousands of years and that, based on the production of salt, has learned to adapt to the conditions and specificities of each historical period. The exceptional quality of Sal de Añana is represented in the fact that many of Spain’s finest Michelin starred chefs including Aneko Atxa (Azurmendi – 3*); Martín Berasategui (Martín Berasategui – 3*); Andoni L Adruis (Mugaritz – 2*); and Francis Paniego (Marques de Riscal – 1*) and other great international chefs continue to use and promote the quality and consumption of Sal de Añana, with each restaurant having their own salt crystallisation pans on site. 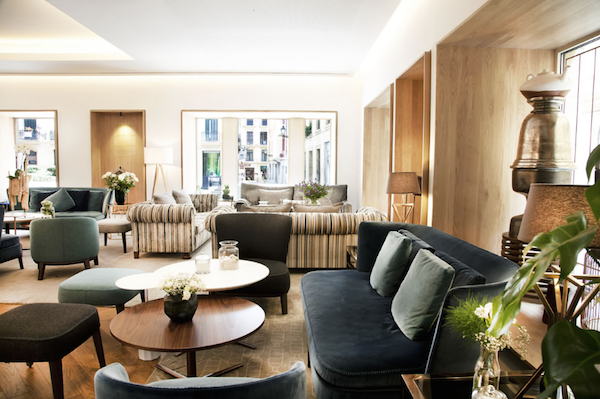 13:00 – Group departure for San Sebastian and check in to your Seaview Room at San Sebastian’s newest 4-star hotel – The Hotel Lasala Plaza. 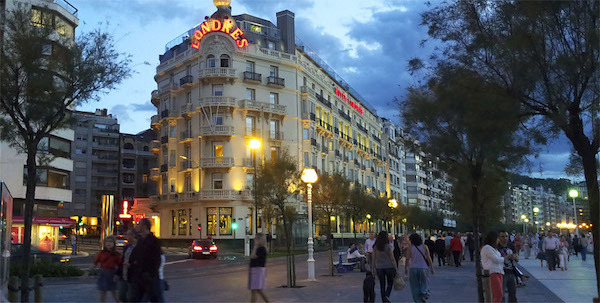 The hotel is situated in an exceptional location in front of the bay at one end of the Old Town. It stands in a small and peaceful plaza which lends the hotel its name, and in which rests a bronze lion, formerly the most important public fountain in the town and a symbol of its history. 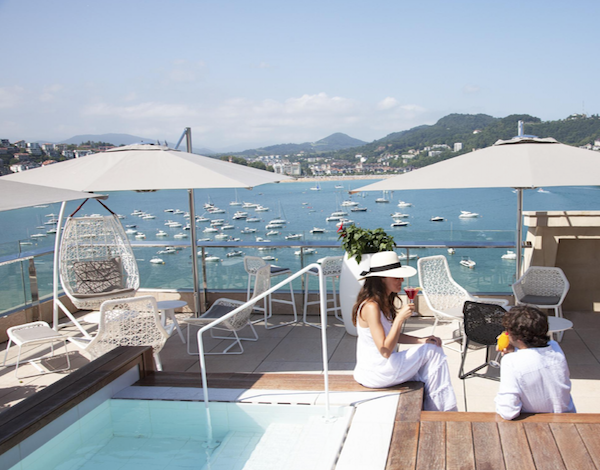 Lasala Plaza Hotel is the only superior four-star hotel in San Sebastián’s Old Town. Lasala Plaza Hotel brings together the glamour and elegance of a town perched on the edge of the sea and an impressive bay. 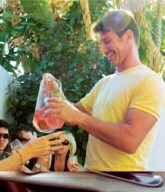 The hotel blends art and local history to create an authentic experience. 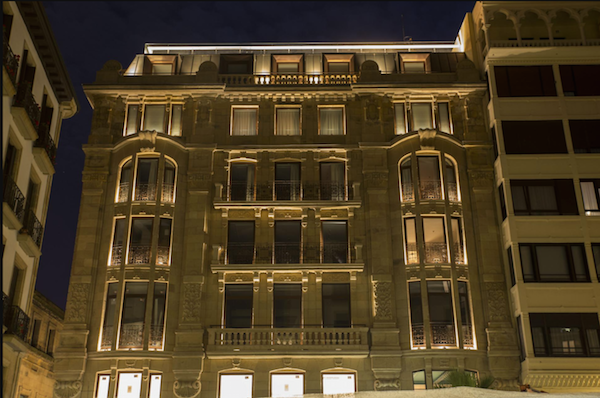 The building dates to 1917 and has been completely reformed, preserving the original architectural style of the façades which invite guests on a journey through time. 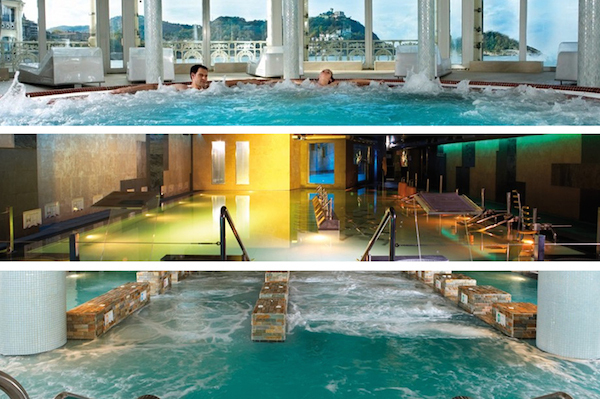 Lasala Plaza Hotel is the only superior four-star hotel in San Sebastián’s Old Town. The sea and Basque culture blend with classical French styling to provide the inspiration for the interior design of the hotel. 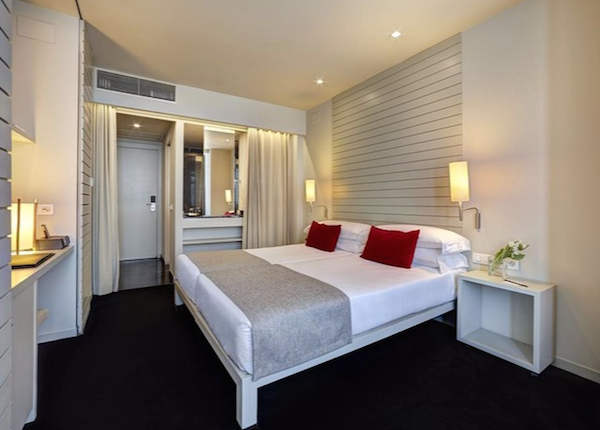 True to the luxury and elegance which has always been part of San Sebastián, all rooms are equipped with cutting-edge technology, designed with high-quality materials and styled with absolute attention to detail to make you feel at home. With its modernised classical French style, the 58 rooms in this elegant, attractive and comfortable hotel keep alive the atmosphere of late 19th-century San Sebastián, transporting you back to a time when the town was one of the fashionable destinations among royalty and high-society travellers. 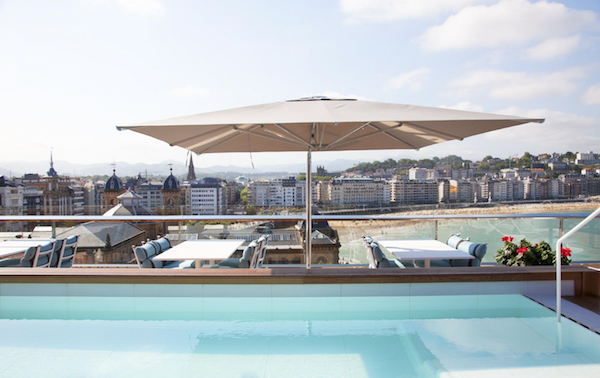 The exclusive rooftop terrace at Lasala Plaza Hotel affords the best panoramic view of San Sebastián—the perfect spot for gazing down on a picture-postcard town. The hotel’s top floor houses our sun terrace, where you can relax outdoors on comfortable sofas and deck chairs.The swimming pool—exclusively for guests—makes this a singular location for taking in the best 360º panoramic view of the fishing port and the town. 18:00pm – Pintxos Appreciation Experience – This evening we will go on a private Pintxos Tour of the Old Quarter and get some “insider’s” tips from locals, Amaia & Nathan, our personal local guides for the evening. We will eat where the locals eat, drink what the locals drinks and most importantly laugh and enjoy life as the locals do. Along the way, Amaia & Nathan will give us some inside knowledge about what it is to be Basque, the nuances relating to pintxos, and also share with you cultural and historical facts of the old town and San Sebastian. 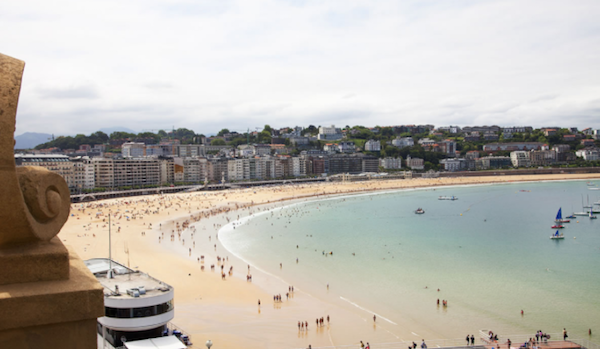 am – Take advantage of our prime beachside position with an early morning walk or cycle along the beautiful La Concha beach or up to Mount Urguel for its spectacular views of San Sebastian’s stunning seaside location. Breakfast – We have selected to allow clients to decide whether they wish to have breakfast at the hotel, rather than including it in the cost of the tour. The price for breakfast at Hotel Lasala Plaza is €27.50 per person. Alternatively, take advantage of your in room Nespresso Coffee Machines or visit one of the nearby bakeries or cafes for a light breakfast at your leisure. Shopping – As the wealthiest city in the region, San Sebastian has a finely honed fashion sense so hit the high streets of San Sebastian for a morning of shopping at some of its unique boutiques and high end shops. Mount Igueldo – Catch the cable car from Ondaretta to the top of Mount Iqueldo for a breathtaking panorama of the city and its half-moon shaped La Concha beach. La Perla Thalassotherapy Spa – One of the most unique experiences we share with our group on our visits to San Sebastian is a visit to the 100 year old, La Perla, Thalassotherapy spa situated directly on the beach at La Concha. 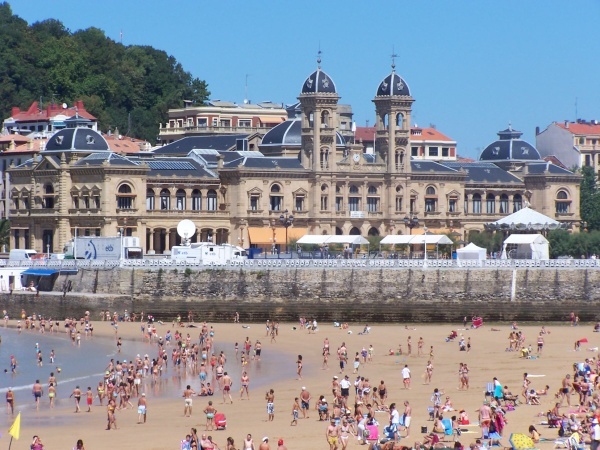 La Perla is a genuine heir of the belle epoque of San Sebastian and was established more that a century ago when Queen Maria Cristina established the royal summer house in the city and sea baths were considered to be a fine pleasure by holidaymakers. La Perla is regarded as the best Thalassotherapy spa in Europe with more that 5,500 m2 of spas and treatment pools overlooking La Concha beach. 17:00pm – Although we have already experienced exploring the wines of La Rioja, this evening we will venture into San Sebastian’s “Parte Vieja” (Old Town) for a pre-dinner “Introduction to Spanish Wines – Wine Tasting” conducted by the knowledgeable and passionate Nerea, who along with her brother, have pursued their passion for Spanish wines and have established one of San Sebastian’s finest wine stores. 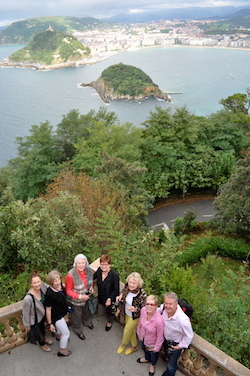 19:00pm – Group Dinner at Restaurante Igueldo – we have arranged for a relaxed alfresco seafood dinner at one of San Sebastian’s port side restaurants, owned by our very close friends the Azkue family. pm – Evening at your leisure. am – Morning at your leisure. 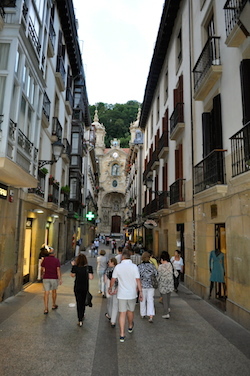 An early morning walk along one of San Sebastian’s grand boulevards or the beach promenade, or maybe just a sleep in. 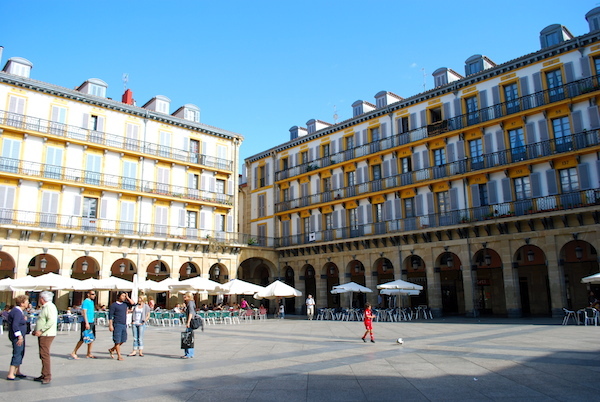 Ayuntamiento – Visit the Ayuntamiento de San Sebastian (Town Hall) built in the latter half of the 19th century. It offers a nice glance at the culture, history and traditions of the ancient seaside town. Tours are by appointment. 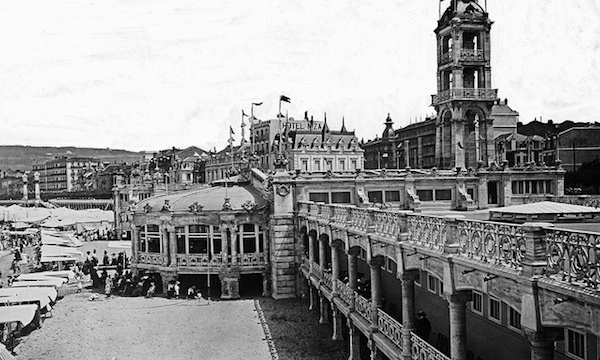 Plaza de la Constitucion – Visit the 1830’s Bibiloteca Municipal in the Plaza de la Constitucion. The beautiful sandstone building built with Tuscan influences sits in the square in which bullfights were held. You can still view the numbers on the balconies of the surrounding buildings in which the residents would rent out to spectators. 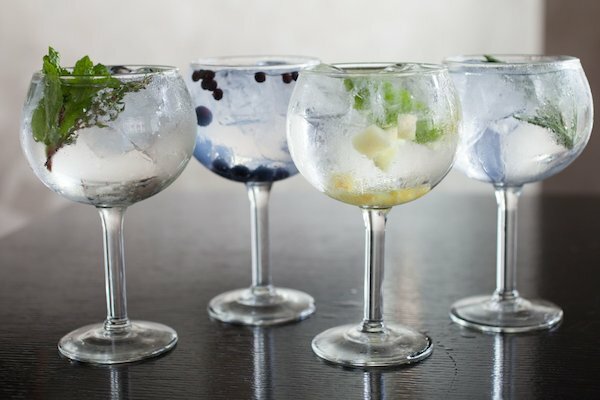 17:00pm – For those of you interested in experiencing Spain’s obsession with Gin & Tonic, we will meet in the lobby for the short walk to experience it first hand . We were surprised to find out on our previous visit to San Sebastian that “Gin Tonic” is actually Spain’s national drink. 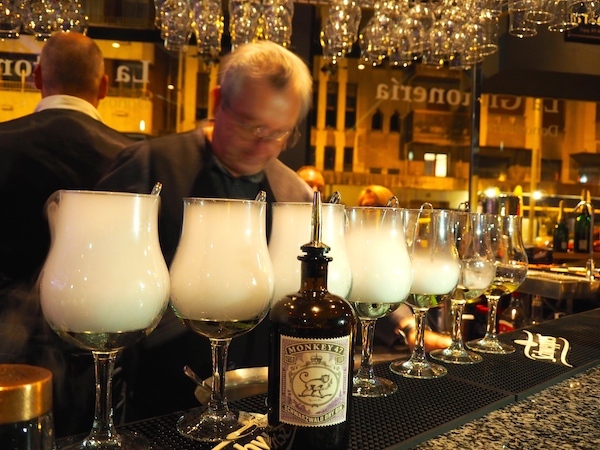 This evening we will share with you one of our favourite “Gintonneria” emporiums where you will experience the alcchemy & passion that San Sebastian’s bartenders have for their “Gin Tonic”. Please click here for a little story we put together about “Gin Tonic – Spain’s Obsession & National Drink”. pm – Remainder of the evening at your leisure. We can use our newly acquired Pintxos Appreciation skills to visit some of our favourite Pintxos bars. am – Morning at your leisure. 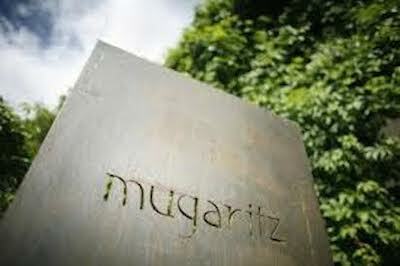 Today we will enjoy our final group lunch at the 2-Star Michelin, MUGARITZ (#9 of The World’s TOP 50 Best Restaurants – 2018) and “Chef’s Choice” as voted by the 50 Best Chefs of the world in 2012) Undeniably, one of the most amazing dining experiences we have ever had, to experience one of Chef Andon Luis Aduriz’s 18 course degustation menus, is to experience “gastronomic theatre” at it’s sensory best. From visiting the kitchen, to meeting one of the world’s most innovative chefs, our previous tour visits here have always been some of the most memorable meals we have ever experienced! 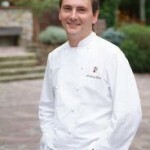 Chef Andoni Luis Aduriz completed his academic studies at the School of Hotel & Restaurant Management in San Sebastian and has worked with such chefs as Juan Mari Arzak and Ferran Adria, as well as serving as head chef with Martin Berasategui at his three Michelin starred restaurant. 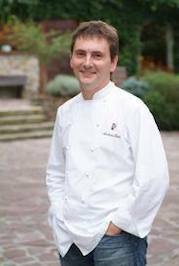 Situated a short drive from the centre of San Sebastian in a rustic yet modern caserio (country cottage), Mugaritz’s 18-course tasting menus change daily according to what chef Andoni Luis Aduriz can obtain at the street markets and what’s growing in the restaurant’s herb garden. His team creates intricate dishes that seek to reconnect diners with nature. His self-dubbed “techno-emotional” approach sees the use of science and a rigorous understanding of ingredients mix with produce-driven cuisine. For another take on the Mugaritz experience, check out what Gary Mehigan of Australia’s MasterChef series said about “my all time favourite meal, absolutely amazing. Five hours and 15 courses later I don’t think I could be any happier with my life”. 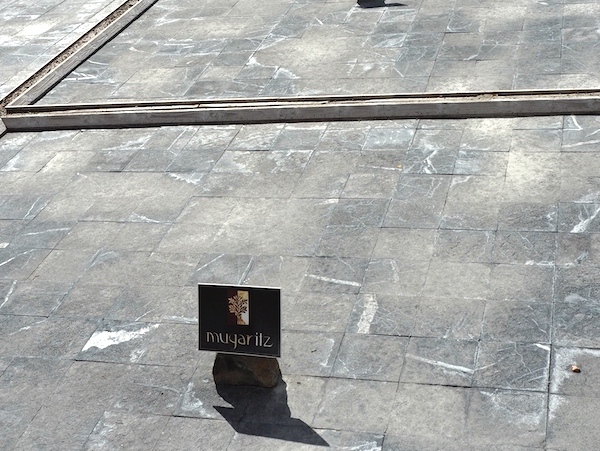 Please click here to read more from Gary’s MUGARITZ experience in 2010.
pm – Final group outing. Depending on what room we have left after Mugaritz’s tasting menu, a final stroll through the narrow streets of the Old Town and along the beach might be in order. am – Check Out from our hotel and final “Hasta luego” (See you later) to the group. Gather up your memories from our special week together in San Sebastian and safe journeys to your next destinations or home! To secure your places, please contact Nico Moretti at urbanprovider@icloud.com or +61 424 564 106, and we will forward you a 2019 “Discover Basque Spain Booking Form”, or please click here – 2019 Discover Basque Spain_BOOKING FORM – to download a copy. Booking Deadline: 01 March 2019 or until booked out. Booking Deposit: A $AUD900 non-refundable BOOKING DEPOSIT is required to hold a booking for the tour, at the time of your reservation. We are able to refund your Booking Deposit should a replacement be found for any cancelled places. We look forward to hosting you on this very special “Discover Basque Spain – Michelin, Food & Wine Experience”. If you have any questions, please don’t hesitate in contacting us.